Look at this! Two weeks in a row. Maybe I’m on to something. This weekend was a good one, not an easy one, but a good one. 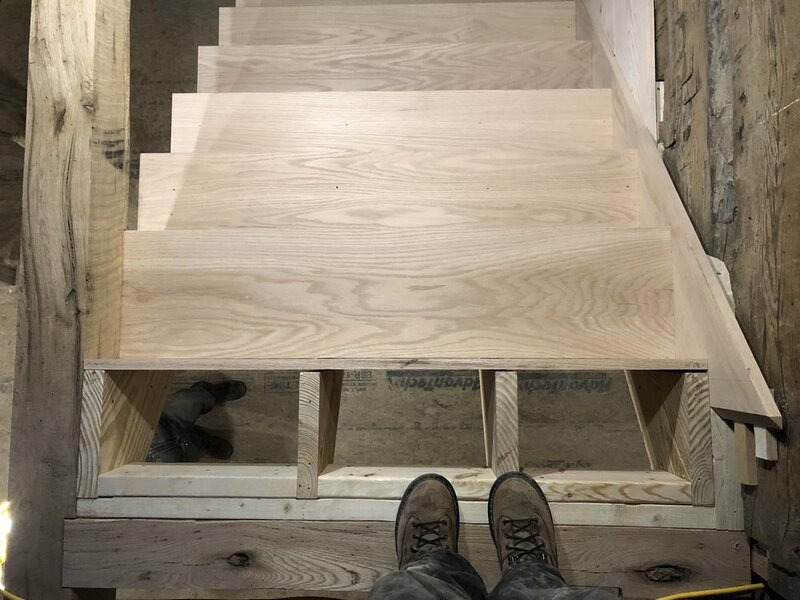 Chase and Dad finished up the treads and risers on the stairs, gluing the finally piece down Sunday. In the end he got it in, and made it look easy, per the usual. Meanwhile I worked on the bathroom layouts, which continue to change. Sunday the snow fell and made me long for the slow days of sitting by the wood stove. Seeing the steps come together already makes the log part inside start to feel like a house and less like a barn. I know I have quite a few big projects to share, like the addition and the porch. I’m working on those. Until then I’ll keep up these little weekend wrap ups. Hope y’all enjoy them, even in their incompleteness and kinda a mess structure. Such is the way of a remodel, so I guess documenting the story shouldn’t be any different. ...and the hole it needs to fit in. per the usual, the scribe master comes through in the end. Wouldn’t even know that was a tricky tread. thank goodness for this old fisher stove. If there’s a wood stove to lay under, Ellie Mae will find it.